Alepidea amatymbica Eckl. & Zeyh. (in part), Alepidea amatymbica Eckl. & Zeyh. var. cordata Sond. The population is estimated to have declined at least 50% over the last three generations (60 years) due to persistent and consistent harvesting pressures for the medicinal plant trade and some loss of suitable habitat for afforestation and crop cultivation. It is a highly sought-after medicinal plant that has been exploited over its entire range both within and outside of South Africa. 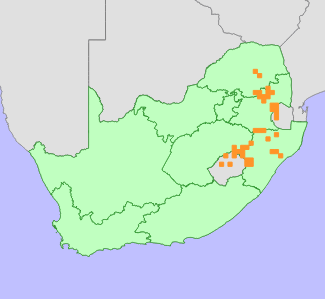 Widespread across the eastern highveld of Mpumalanga, the eastern Free State, and north-western KwaZulu-Natal. It occurs along the north and north-eastern borders of Lesotho and is also found in Swaziland, on the Eastern Highlands of Zimbabwe and the Chimanimani Mountains of Mozambique (Hutchinson, 2016). Forest margins, west and south facing mountain slopes and near drainage lines or islands within wetlands (Hutchinson 2016). The primary threat to A. cordifolia is unsustainable utilization of wild-harvested plants for traditional medicine, where it is referred to as 'Ikhathazo', 'Iqwili' or 'Lesoko'. These names refer to a number of closely related Alepidea species, including A. cordifolia, A. amatymbica or even A. macowanii, the highly range-restricted species from the Winterberg mountains of the Eastern Cape (Hutchinson 2016). In addition, A. cordifolia was until recently included within A. amatymbica (Van Wyk et al. 2008) and is distinguished from A. amatymbica by its cordate leaf bases and hispidulous axes subtending the umbels. The rhizomes of both species, which are the parts of the plants used in traditional medicine and recorded in muthi markets, are morphologically indistinguishable. Literature on the medicinal utilization of Alepidea species typically refer to plants by their common names, and it is therefore not easy to estimate the impacts of harvesting or scarcity of individual species in the wild based on market surveys. The species' distribution ranges however do not overlap, and therefore some inferences can be made based on the location of studies. In comparison to A. amatymbica and A. macowanii, which are both South African endemics predominantly restricted to the Eastern Cape, A. cordifolia spans five countries, and has much wider use. A. cordifolia has been hailed as the most frequently utilized medicinal plant in Mpumalanga (Mander 1997) and the second most frequently used in KwaZulu-Natal (Cunningham and Davis 1997, Mander 1998). Numerous studies have reported on its highly sought after rhizomes for medicinal use and its growing scarcity due to the exploitation and overharvesting of wild populations for the urban muthi market trade (Gerstner 1939, Cunningham and Davis 1997, Maroyi 2008, Van Wyk et al. 2008). Plant traders report having to travel further and further to find plants due to local extinctions at more accessible sites. Mander (1998) estimated that travelling times between the harvest sites and the market for A. cordifolia had increased by 33% (>2 hours increase) between 1988 and 1998. Cunningham (1988) cites the local disappearance of A. cordifolia from Mpendle Mountain and traditional practitioners in the Nxamalala Tribal Authority area reporting that they thereafter had to resort to sourcing the species from markets in Pietermaritzburg. Cunningham (1988) estimated that 519 50kg-size bags of A. cordifolia rhizomes were sold annually in the KwaZulu-Natal region. At the time, it was the third most traded species in terms of annual volume. Cunningham (1988) further estimated that one bag contains about 485 individual rhizomes, hence >251 000 individual rhizomes were traded annually in the region in the 1980s. At the time, only rural herbalists (and not urban traders) considered the species as becoming scarce and they ranked it the ninth most scarce species (Cunningham 1988). The species was further classed as 'declining' - i.e. a species that was recently widespread but was likely to become vulnerable and continue to decline of destruction of wild populations continued. In 2001, at least 9% of traders sold 'Ikhathazo' at the Faraday Street muthi market in Johannesburg (Williams 2003). The species is very popular in the market and scarcity is limiting availability, and therefore trade volumes recorded may be an underestimate. Formal and informal sectors (shops and street traders respectively) have different sources of supply, hence the quantity sold in each the region annually is probably more than double what is actually recorded. At large markets with a range of sources such as Faraday it is the most difficult to tell which Alepidea species is sold as 'Ikhathazo'. Hutchinson (2016) used chemical analyses of rhizomes to conclude that A. cordifolia was the most prevalent of the 'Ikhathazo' species traded at Faraday. In terms of the international trade, Marshall (1998) records it being imported into Mozambique, Botswana and Zimbabwe from South Africa due to its popularity with locals in those markets. Marshall (1998) further lists A. cordifolia as a 'conservation concern' in South Africa, Lesotho, Swaziland and Zimbabwe (where it is very rare). Maroyi (2008) provides more recent evidence of the ongoing popularity and pressure on this species in Zimbabwe. Also, since the species has become scarce in KwaZulu-Natal, plant material has for some time been imported from Lesotho to South Africa (Mander 1998, Letsela 2004). In addition to the loss from unsustainable harvesting this species has also lost habitat to afforestation and crop cultivation. Its habitat of drainage areas in grasslands are also infested with alien invasive plants in many parts of Mpumalanga and KwaZulu-Natal. The species has been over-exploited over most of its distribution range in KwaZulu-Natal. While still said to be locally abundant where not exploited, but becoming rare and extirpated in many areas, including the KwaZulu-Natal Midlands, where harvesting activities have been the highest (Scott-Shaw 1999). Letsela (2004) recorded A. cordifolia density in communal versus protected areas in the Tsehlanyane-Bokong Biosphere Reserve, northern Lesotho. Adult plant density in protected areas was twice the density of plants in unprotected areas, and local extinctions of unprotected subpopulations had occurred in many parts of the country. Furthermore, high utilization pressures had led A. cordifolia to retreat to less accessible places in many parts of Lesotho, and harvesting intensity has generally decreased with increasing distance from the nearest village (Letsela 2004). In Mpumalanga, scarcity in communal lands and tribal areas are driving increasing harvesting pressure in protected areas (M. Lötter pers. comm. 2016). A private landowner in the Luneburg area (southern Mpumalanga) has reported drastic declines in three of four A. cordifolia subpopulations on his property, as well as targeting of other medicinal species. Based on the above evidence of decline as well as extensive consultation with conservation officials and botanists across this species range an over 50% decline in the population is suspected to have taken place over the past 60 years (three generations). Arnold, T.H., Prentice, C.A., Hawker, L.C., Snyman, E.E., Tomalin, M., Crouch, N.R. and Pottas-Bircher, C. 2002. Medicinal and magical plants of southern Africa: an annotated checklist. Strelitzia 13. National Botanical Institute, Pretoria. Botha, J., Witkowski, E.T.F. and Shackleton, C.M. 2001. An inventory of medicinal plants traded on the western boundary of the Kruger National Park, South Africa. Koede 44(2):7-46. Cunningham, A.B. and Davis, G.W. 1997. Human use of plants. In: R.M. Cowling, D.M. Richardson and S.M. Pierce (eds. ), Vegetation of southern Africa (pp. 474-506), Cambridge University Press, Cambridge. Germishuizen, G., Meyer, N.L., Steenkamp, Y. and Keith, M. (eds). 2006. A checklist of South African plants. Southern African Botanical Diversity Network Report 41 SABONET, Pretoria. Gerstner, J. 1939. A preliminary checklist of Zulu names of plants. With short notes. Bantu Studies 13(1):307-326. Hutchinson, S. 2016. Towards a taxonomic revision of the medicinally important genus Alepidea (Apiaceae): The systematics of the sections Setiferae and Leiocarpae. Unpublished M.Sc., University of Johannesburg, Johannesburg. Letsela, T. 2004. Sustainable utilization of communal plant resources within the Tsehlanyane-Bokong Biosphere Reserve in Lesotho. Unpublished Ph.D., University of the Witwatersrand, Johannesburg. Mander, M. 1997. Medicinal plant marketing in Bushbuckridge and Mpumalanga: a market survey and recommended strategies for sustaining the supply plants in the region. Danish Cooperation for Environment and Development, Danish Environmental Protection Agency, Strandgade. Maroyi, A. 2008. Ethnobotanical study of two threatened medicinal plants in Zimbabwe. The International Journal of Biodiversity Science and Management 4(3):148-153. Marshall, N. 1998. Searching for a cure: conservation of medicinal wildlife resources in East and Southern Africa. TRAFFIC International, Cambridge. Prentice, C., Symmonds, R. and Crouch, N. 1998. Ikhathazo in trouble. Reversing the declining fortunes of Alepidea amatymbica (Apiaceae). PlantLife 19:22-24. Van Wyk, B.E., de Castro, A., Tilney, P.M., Winter, P.J.D. and Magee, A.R. 2008. A new species of Alepidea (Apiaceae, subfam. Saniculoideae). South African Journal of Botany 74(4):740-745. Weimarck, H. 1949. A revision of the genus Alepidea. Botaniska Notiser 4:217-268. Williams, V.L., Balkwill, K. and Witkowski, E.T.F. 2000. Unravelling the commercial market for medicinal plants and plant parts on the Witwatersrand, South Africa. Economic Botany 54(3):310-327.